Does 20/20 Vision equal “Perfect” vision? Simply stated: no. The majority of patients achieve better than 20/20 vision when they come to us for LASIK. When any patient visits 20/20 Institute for LASIK and is a good candidate, our LASIK Specialists customize a treatment plan designed to maximize each eye’s probability of safely achieving 20/20 or better vision. This approach of utilizing only our most advanced treatment technology for every patient takes advantage of one of the most significant advancements in LASIK, Wavefront Optimized® LASIK, which is designed to improve both the patient’s probability of achieving a 20/20 or better visual result and to give the patient the best chances for quality night vision. When we discuss the customized treatment with our patients, many times they ask questions like, “What does 20/20 actually mean?”, “What is the difference between quantity of vision and quality of vision?” In this article, we answer those questions and how they relate to LASIK at 20/20 Institute. So, Jack says that Jill “is 20/20.” What does that mean? One of the more common misunderstandings that some patients have is that 20/20 vision means no glasses at all. Thanks to one of the many “gifts” that come with more birthdays, all eyes 45 or older manifest a condition called presbyopia, a person can have 20/20 vision for distance and still need glasses for near-range vision. We discuss presbyopia and how it relates to LASIK in another blog post here. In the US, Visual Acuity is represented by a fraction. The top number is always 20, and the bottom number quantifies the clarity of the person’s vision compared to what is considered normal. The top number represents how far away YOU are from an object while viewing it, while the bottom number represents the size of the letter or object that you are looking at. The bottom number also indicates how far away the “normal” vision person can be from that same object and still be able to correctly identify it. Let’s say that your vision is 20/200. That means you would have to stand 20 feet from an object (such as a street sign) to correctly identify it, while a person with “normal” vision could stand 200 feet away and correctly identify that same object. So in this example, your vision is worse than “normal,” and you see less than what a person with 20/20 vision sees. On the flip side, let’s say that after LASIK your vision is 20/15 without glasses or contacts. With 20/15 vision, you will be able to stand 20 feet away from an object and correctly identify it, while the person with “normal” vision would have to stand 5 feet closer to that same object (15 feet away) to correctly identify it. At 20/15, your vision is better than what is considered “normal,” and you see more than what a person with20/20 vision can see. 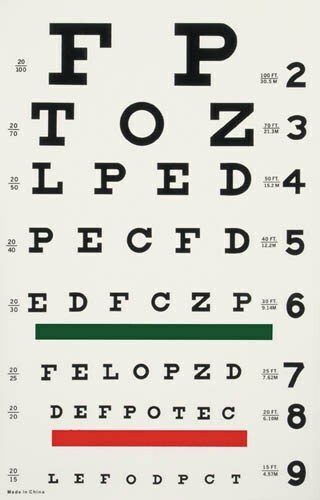 Each row of letters on the Snellen Eye Chart corresponds to a particular Visual Acuity value (ie: 20/20, 20/200, 20/15). When testing Visual Acuity, the chart is placed a standardized distance away (usually 20 feet in the US), and the patient looks at the chart and reads aloud to the doctor or technician the smallest set of letters that they can see. The smallest (or lowest) line able to be correctly identified determines the patient’s Visual Acuity. This test is typically done one eye at a time as each eye may have differing Visual Acuities. Good vision is a blessing and in many cases, it’s a requirement. Minimum Visual Acuity requirements exist in various forms for many professions, licensures, and recreational activities. Occupations and recreational activities like truck drivers, pilots, and air traffic controllers need to see well enough to do those things safely. Similarly, every person who wishes to operate a motor vehicle must obtain a driver’s license, and there are minimum Visual Acuity requirements to pass and qualify for a driver’s license. For individuals who do not have sufficient Visual Acuity to pass those tests naturally, the good news is that there are options available. One question that comes up from time to time is “Does everyone with 20/20 vision see the same?” This question raises a very important topic for people who care about the quality of their vision. Surprisingly, to some, the answer is no. 20/20 vision is considered the standard of normal vision, but it is a measurement of the quantity of a person’s vision. Essentially, Visual Acuity is a measurement of how much a person can see. However, it’s possible for two people to subjectively describe their vision differently even if both of them have 20/20 sight. Some people with 20/20 vision may say that their nighttime vision is fine. Others who also have 20/20 vision may say they don’t like the quality of their night vision, even to the point where they are uncomfortable driving at night. There are different qualities of vision, and thanks to advancements in technology and the development of wavefront technology, we understand more about the ocular visual system and the factors that can impact the quality of a person’s vision. The most common causes of blurry vision are called Refractive Errors – myopia (nearsightedness), hyperopia (farsightedness), and astigmatism – these reduce the quantity of what a person can see. Myopia and hyperopia are caused by a situation where the light-focusing structures of the eye (the cornea and the crystalline lens) have the incorrect optical power for the length of the eye. Astigmatism can exist by itself or in conjunction with either myopia or hyperopia and is caused by having an eye shape that is out of round (think egg-shaped vs perfect sphere). Refractive Errors are the Low-Order Aberrations that can be present in the human visual system. When these are present, they reduce the quantity of a person’s vision but most of the time can be corrected using FDA Approved methods including glasses, contact lenses, or surgical vision correction procedures like LASIK. Glasses and contact lenses are prescribed to be worn by the patient to account for the incorrect focusing power of the eye, and when prescribed accurately, they work as long as a person wears them. In a LASIK procedure, the goal is to improve the person’s vision without glasses or contact lenses, and it works by altering the shape of the cornea using an excimer laser so that the new shape focuses the light better on its own. Beyond Low-Order Aberrations, there are more complex distortions that exist in everyone’s visual system because of the structure of the eye and how vision works. As light passes thru the eye to the retina, it passes through the structures that help focus the light onto the retina, the cornea, and the crystalline lens. Irregularities in these lenses can cause distortions known as High-Order Aberrations, and if a person has a significant amount of High-Order Aberrations present in their visual system, they tend to have a lower quality of vision. All eyes are imperfect, so all eyes have some amount of High-Order Aberrations. As well, our brains can adapt to these smaller distortions, so, for most people, these distortions do not bother them visually unless they dramatically and permanently change. When LASIK was first introduced and performed in the mid-90’s thru early 2000’s, it was quickly proven to be an accepted surgical procedure to correct vision. The majority of patients achieved 20/20 vision, but one very significant downside of the early results was that many patients reported worse night vision than they had before LASIK. Night-time glare and halos that were not present before LASIK now made some patients uncomfortable with nighttime driving. This is understood to be caused by the tendency of early LASIK lasers to increase High-Order Aberrations on the cornea, specifically, the High-Order Aberration called Spherical Aberration. Spherical Aberration is an optical effect where light rays that enter the peripheral part of the cornea are refracted more than light rays that enter the cornea towards the center. So with a cornea that has induced Spherical Aberration, daytime vision tends to be better quality of vision than nighttime because of the difference of pupil size in bright vs low light situations. In low-light situations when the pupil is larger, light also enters the eye thru the more peripheral part of the cornea and is refracted differently than in the more central part of the cornea. The visual result of this is glare and halo. The natural architecture of the cornea is that it is an aspheric lens. In optics, an aspheric lens has a shape such that the light rays, no matter where they enter the lens across the diameter of the lens, all converge to a single focal point behind the lens. LASIK excimer lasers that were FDA-Approved before Wavefront technology was introduced, have a tendency to sculpt the cornea in a way that upsets the natural aspheric shape of the cornea and induces Spherical Aberration. The main reason older LASIK lasers have a tendency to increase Spherical Aberration has to do with the fact that the laser pulses tend to have a greater effect in the central part of the cornea than they do towards the peripheral cornea. In the central part of the cornea, the laser pulses reach the cornea at an angle that is perpendicular to the plane of the cornea at that point, so the intended amount of energy is transmitted to ablate the desired amount of tissue with each pulse. However, the pulses that reach the cornea further and further away from the center of the cornea have a greater angle of incidence (not perpendicular to the plane of the cornea at that point) which reduces the amount of energy actually transmitted to that area. When this occurs, the result is that less tissue is ablated in the peripheral cornea than in the central cornea, upsetting the natural aspheric shape of the cornea by making it flatter in the middle than the edges. Today’s most advanced LASIK excimer lasers incorporate principles of wavefront technology in response to the glare and halo side effects created by early LASIK lasers. The main objective in this significant leap forward in LASIK technology is to be able to alter the curvature of the cornea to correct the patient’s eyeglass prescription and avoid the induction of Spherical Aberration at the same time. A Wavefront Optimized® custom ablation is a patented technology built inside of a particular brand name of excimer laser for LASIK named WaveLight. The first wavefront LASIK treatment was done on a WaveLight laser, with the first generation WaveLight receiving FDA Approval in 2003. The company has continued to innovate and improve and has upgraded the WaveLight lasers twice since 2003. The second-generation WaveLight, the Allegretto Wave Eye-Q, was FDA Approved in 2006, and their most recent generation, the EX-500, received FDA approval in 2011. The Wavefront Optimized® custom ablation incorporates measurements of the curvature of the cornea into the treatment planning so that the laser’s treatment is customized to the corneal curvature, and, in particular, to the peripheral cornea. The result is a more optically pure way of reshaping the cornea with LASIK as compared to older lasers, as the Wavefront Optimized® custom ablation accounts for the angle of incidence to prevent or reduce the creation of Spherical Aberration. To get all of the details about the EX-500 excimer laser from WaveLight, visit this site. Every 20/20 Institute patient receives a Wavefront Optimized® treatment on the WaveLight EX-500 that is customized to the unique visual system of each eye. Our doctors believe this is the best way to provide LASIK in order to maximize every patient’s probability of outcome and to give our patients the best chances of quality night vision after LASIK.